During American Heart Month and all year round, use education, motivation, dedication, and support to help team members and people in your community reduce or prevent heart disease. February is Heart Health Month, the perfect time to generate discussion about heart health awareness and the good habits that can improve the health of both women and men. Keeping food diaries and fitness journals, using healthy portion plates, and following healthy cooking tips will help them adopt heart-healthy lifestyles. The many health gifts and educational products available from Positive Promotions also help get the message out about heart health and women's heart health at schools, colleges, hospitals, and other businesses. 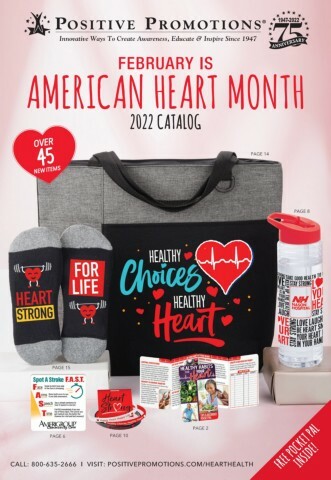 For any Heart Health fair or seminar, hospitals, community health departments, primary care physicians, cardiovascular specialists, and occupational health professionals can hand out educational tools and incentives featuring our exclusive awareness themes. From food diaries that stress heart-healthy diets and informational booklets about heart disease facts to message pens, bookmarks, and more, many of our promotional products can be customized with your logo or slogan. You'll also find health gifts such as awareness t-shirts, flashlights, personalized lunch coolers, and lapel pins, all thoughtful giveaways to keep on hand for health fairs, military or corporate wellness events, and school or local celebrations.